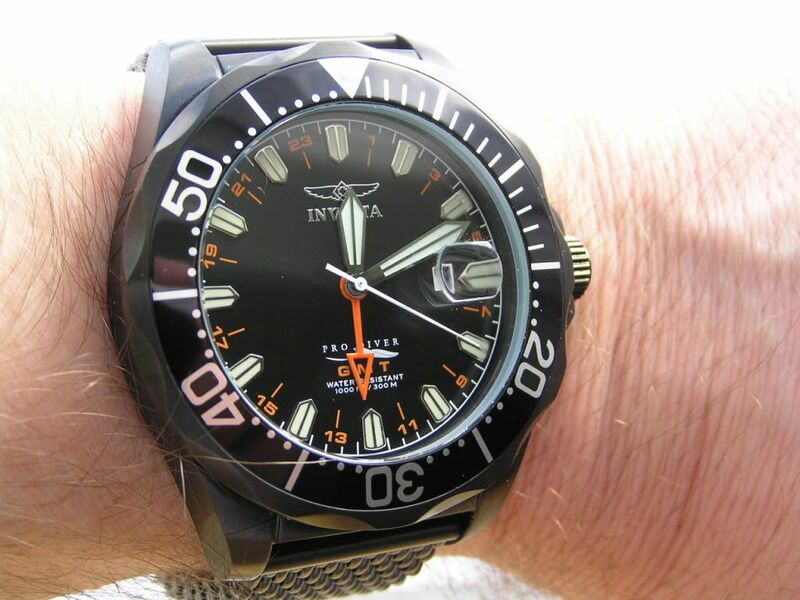 This Invicta Pro Diver GMT starts out with a reliable Ronda quartz Cal. 515 movement (a very good GMT movement I’ve had in other watches). Independently adjustable GMT hand, Swiss Made, so I guess that’s how Invicta can claim this watch is Swiss Made. Anyways, what really grabbed me about this watch was the combination of orange accents, jet black dial and matte black IP finish. It just has a real bad boy look to it. This is a large watch, but not stupid large, if you know what I mean. Case without crown clocks in about 46mm, maybe a tad bit larger. Lug width is 22mm; case thickness is 13.5. 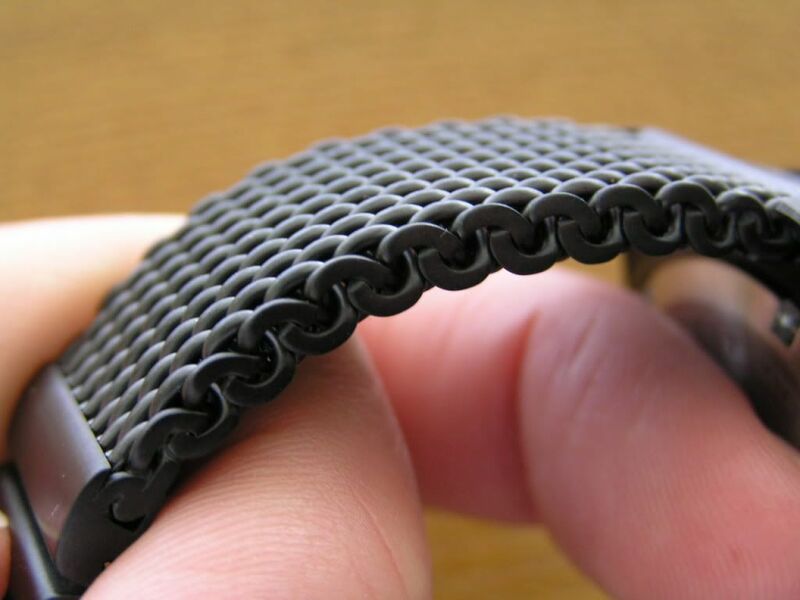 The mesh bracelet measures a sturdy 4mm thick on its own! Yet it still works well on my thinner wrist. The mesh bracelet was another reason I ordered this puppy. I haven’t owned any mesh styles before and wanted to give one a try, especially since they seem to be getting popular as of late. This is the type of mesh design that has solid links on the ends, next to the clasp for sizing. I wasn’t sure how much I would like this, thinking it would distract from the mesh itself, but it really doesn’t, especially since I took most of the links out to fit my wrist. I was worried that this bracelet might not size up to fit my wrist, but it did, with a couple links to spare. 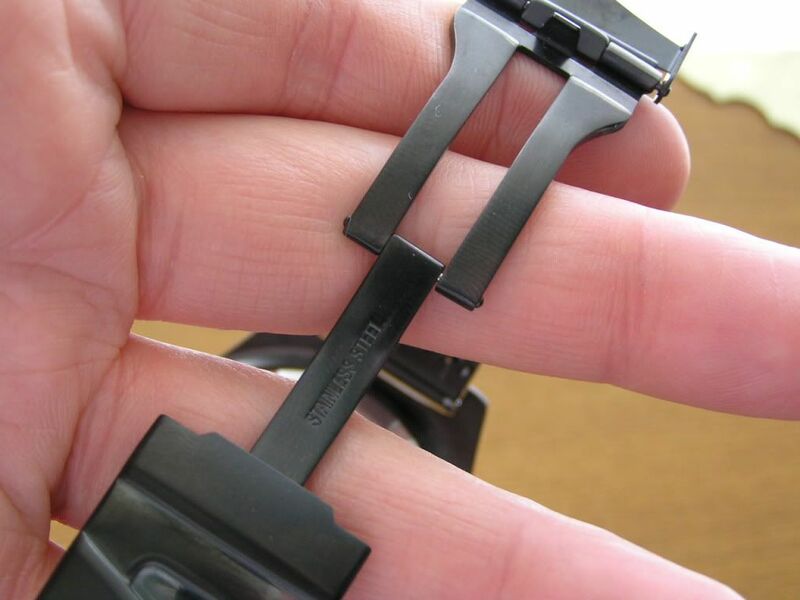 The bracelet itself appears to be very well made, thick, solid and not loose or rattle-prone. The solid links are nicely finished and the clasp is a signed, double locking affair. The deployant is a proper machined style, although it is a bit thinner than some, but that is okay because it fits a bit better that way. I was concerned about the IP finish, how good would it be? Would it be durable? The finish is fantastic so far, evenly applied, everything on the watch is covered, except the screw down back (standard silver finish stainless steel) and the bezel insert. The entire bracelet, clasp and deployant are covered, too. Since I don’t wear each of my watches on a regular basis, I feel the finish will hold up for me. For others who would wear this watch everyday, who knows? 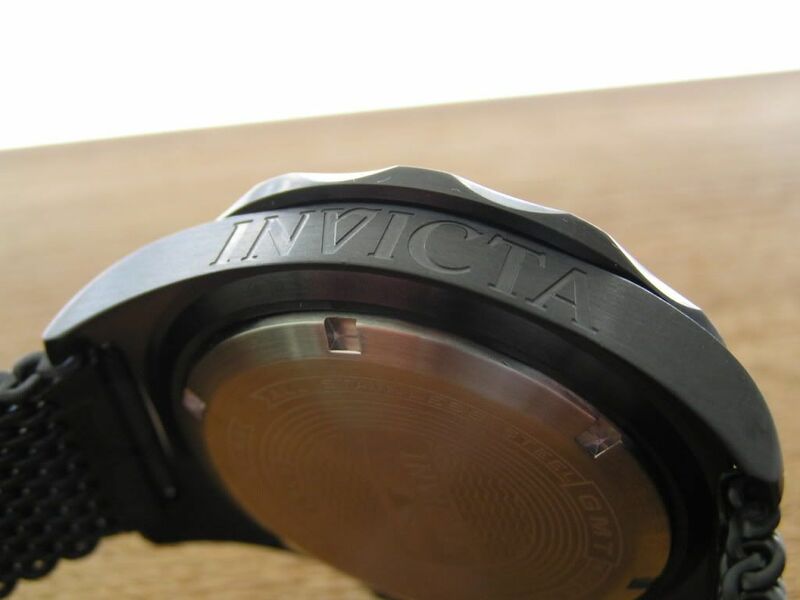 I know some have complained about the quality of Invicta’s IP coatings in the past. The color is also a perfect matte black, not shiny but not flat. It does show a few fingerprints which may be distracting to some, but they wipe right off. 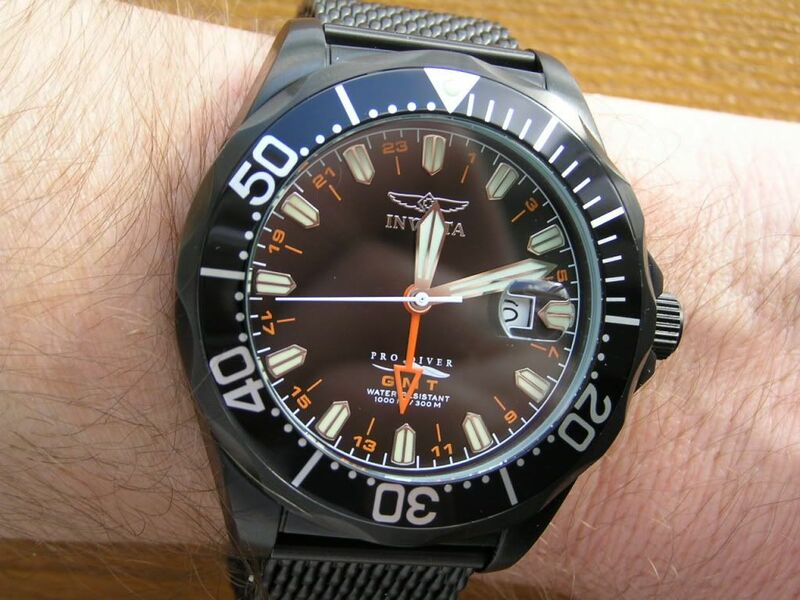 This watch is rated at 300 meters water resistance, which is nice, although if you were to use it for actual diving, the lack of a luminous second hand would be a major fault. 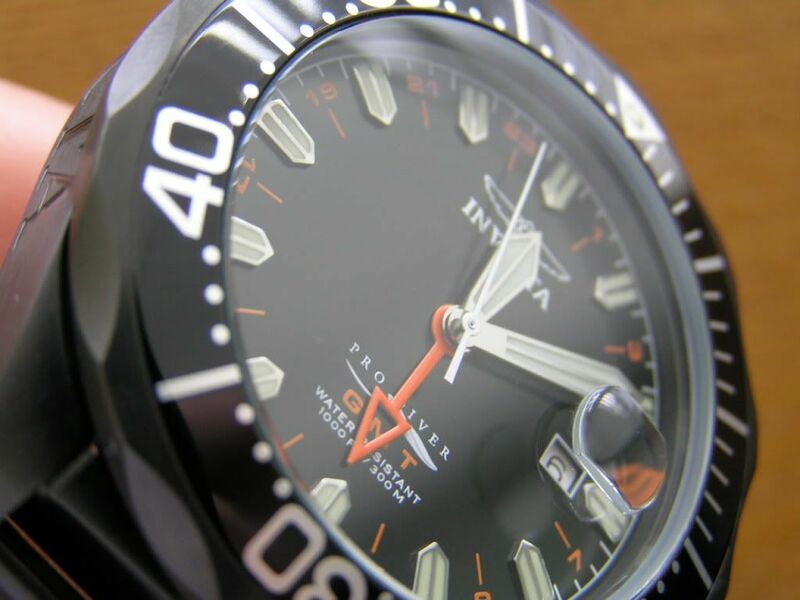 The applied markers are luminous, as well as the hour and minute hands and the pip on the bezel at 12. 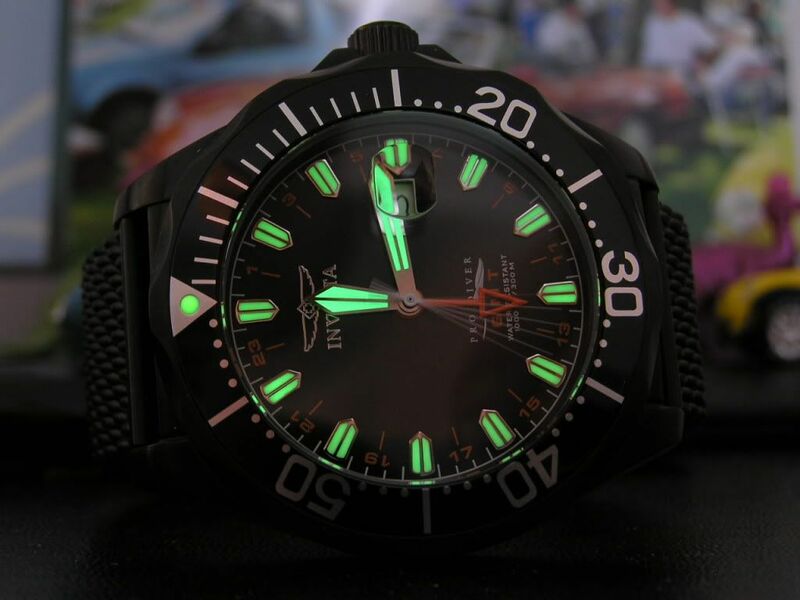 The quality of Invicta’s Tritnite™ lume seems acceptable to me. The orange GMT hand has a skeleton tip (no lume) and the second hand is white. I do like the long pointer style of the second hand. It also hits the chapter ring markers pretty much dead on. 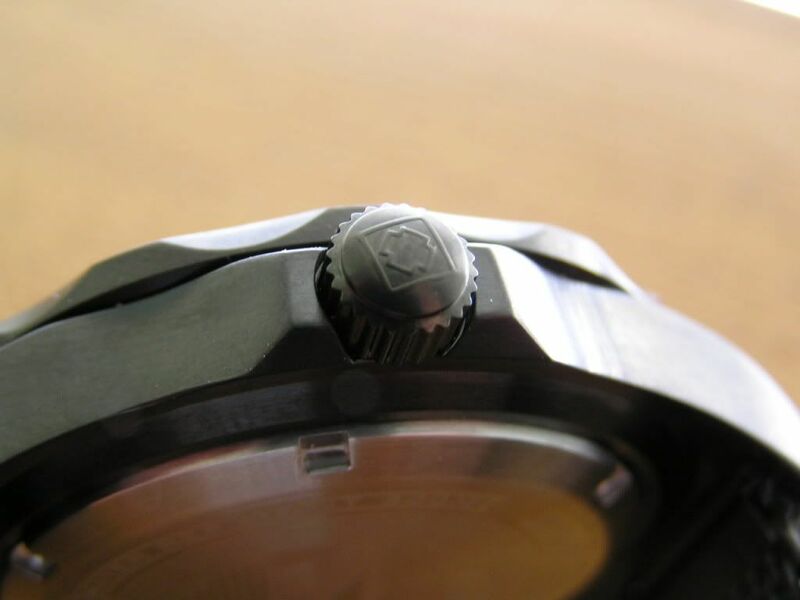 The bezel is a 120-click variety with a bit of play, the tastefully signed crown screws down very nicely (probably the best screw down crown I’ve had on an Invicta) and the crystal is mineral with the dreaded cyclops. At least this cyclops is glued on straight and does a good job magnifying the date. 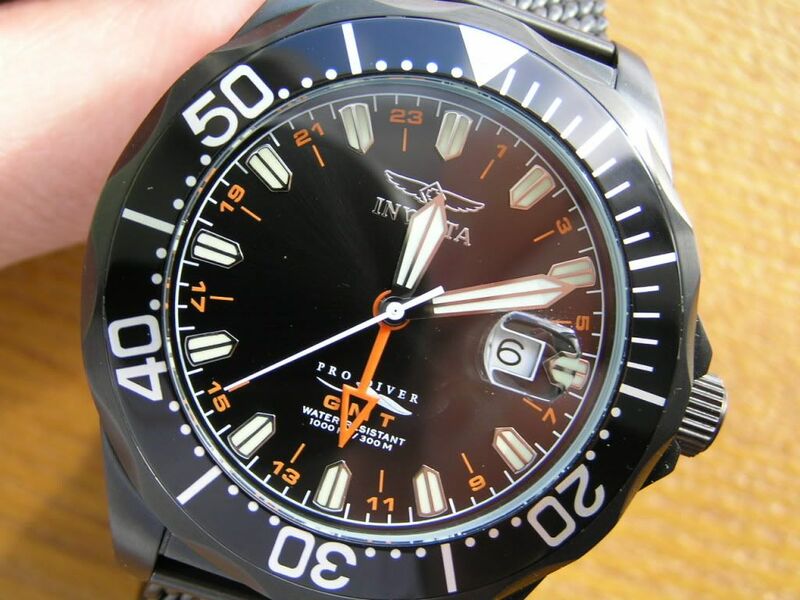 This model still has some flashy Invicta traits I don’t really care for, mainly the wing logo on the dial and the signed case (but with the black IP coating, the signature pretty much blends into the case). 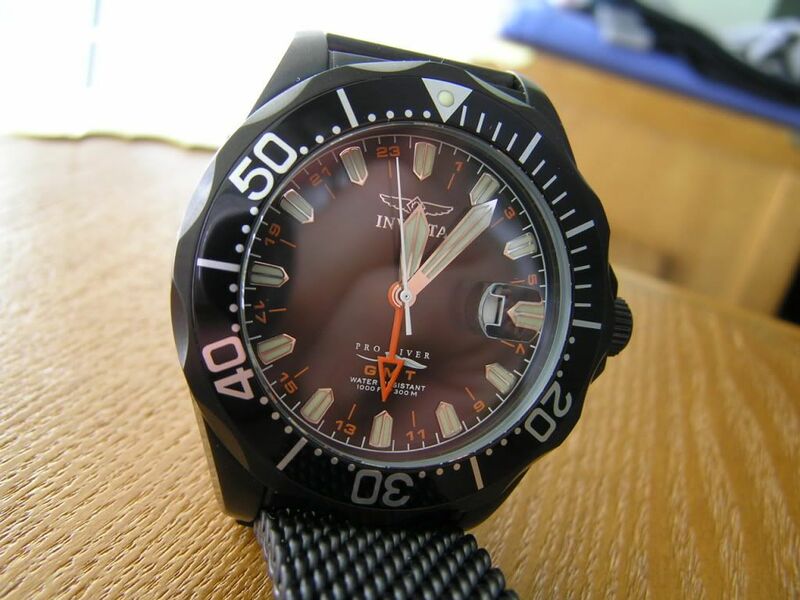 The dial is jet black and glossy and I do love the orange ‘GMT’ emblazoned on the dial. 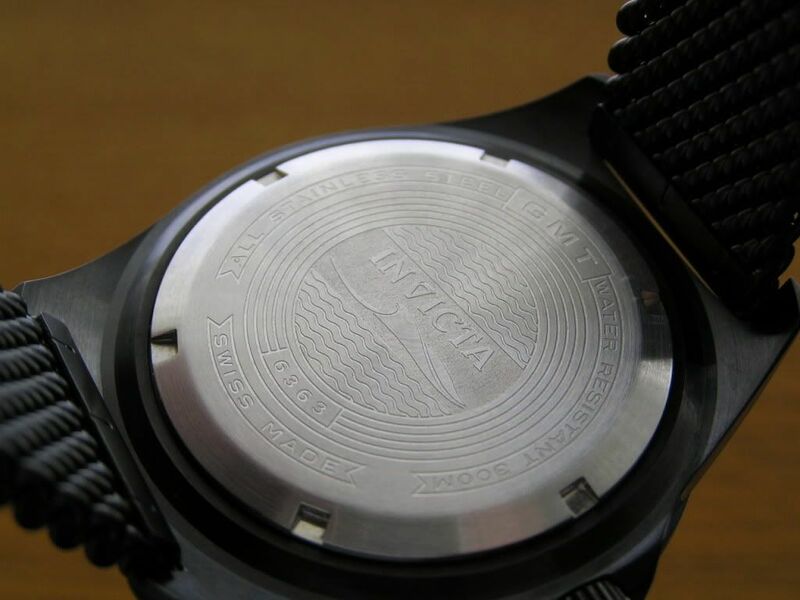 I don’t want to go out on a limb here, but it appears that Invicta’s quality has improved. This GMT model is a real gem. They have several other GMT models on the mesh bracelet, in both standard silver finish and black IP with various dial colors. I can honestly say this watch rocks and is a steal for the price. I owned this watch for about a year and decided to sell it to fund other purchases. Overall, I liked the watch and the mesh bracelet alone is worth the price of admission. Very nice review with great photos. I own a SS version. You're absolutely correct about the mesh band. I'm surprised Invicta sprung for such a high quality mesh band for this inexpensive model. The low maintenance quartz movement's great too. Overall, I really like this watch.